As dawn was breaking on Sunday morning, June22, 1941, military forces of Germany, Finland and Romania suddenly struckagainst the Soviet Union along a broad front stretching hundreds of miles fromthe Arctic Circle in the far north to the Black Sea in the south. Italy,Hungary, Slovakia, and Croatia quickly joined the campaign – the largestmilitary offensive in history. Soldiers from those nations were soon joined byvolunteers from other European countries, including France, Netherlands,Denmark, Norway, Spain, and Belgium. Thestunning news of this attack was announced to the world by German radio at 5:30that Sunday morning, when Reich Minister Joseph Goebbels broadcast the text ofa proclamation by Adolf Hitler to the German people that laid out his reasonsfor the historic offensive. Followingthat was the broadcast of Germany’s declaration of war against the SovietUnion. This was in the form of a diplomatic note to the Soviet government, readby Foreign Minister Joachim von Ribbentrop to a packed and hastily organizednews conference of journalists representing the German press, as well asnewspapers across Europe and overseas. ThisForeign Office statement explains in some detail the German government’sreasons for the momentous decision to attack the USSR. 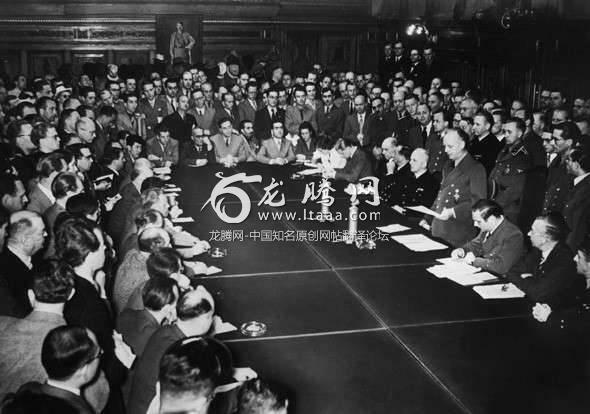 About two hours earlier,Ribbentrop had given the text to the Soviet ambassador in Berlin, while at thesame time the German ambassador in Moscow was delivering a shorter version ofit to the Soviet Foreign Minister. Germanleaders did not know that the Soviets were already producing the T-34, KV-1 andKV-2 tanks, the heaviest and most deadly in the world, and more formidable thanany German model. Nor they did they know that the Soviet military had more than4,000 amphibious tanks – which were meant only for offensive operations – whilethe Germans had none. Actually, it was the Soviet Union – the world’smost oppressive regime at the time – that was dedicated to the eradication of“free democracies” and to the ultimate triumph of “proletarian dictatorship” inall countries. Stalin had made clear his elemental hostility to “freedemocracy” when the Red Army tried impose a Bolshevik regime on Finland in the“Winter War” of 1939-1940. In fact, soldiers of Finland – a parliamentarydemocracy – were now fighting as allies of Hitler’s Germany against theSoviets. Inrecent years, however, a growing number of historians have assembledconsiderable evidence that validates key points made by Hitler and the Germangovernment, and which shows that the Soviets were preparing a massive assault.The most influential of these historians has probably been a former Soviet GRUmilitary intelligence officer, Vladimir Rezun. In a series of books writtenunder the pen name of Viktor Suvorov, he has presented impressive evidence toshow that the Soviet regime was preparing a massive offensive against Germanyand Europe, and that the German-led attack forestalled an imminent Sovietstrike. It is Stalin, not Hitler – he says – who should be considered the“chief culprit” of World War II. Numerousdocuments and other historical evidence have come to light in recent decadesthat validate key points made in the German statements of June 22, 1941. Thisevidence also thoroughly discredits the simplistic portrayal of theGerman-Soviet clash, and indeed of the Second World War itself, that USofficials and prominent historians presented to the American public during thewar, and for years afterwards. Even ifthe leaders in Germany, Finland, and other European countries were mistaken inbelieving that a Soviet assault was imminent, they certainly had ample reasonto regard the Stalin regime as a dangerous threat, and to conclude that theSoviets were deploying vast military forces in preparation for attack at somepoint in the future. The reasons given by Hitler and his government to justifythe German-led attack were not lies or pretexts. Indeed,the German, Finnish, and Romanian leaders had more valid and substantive causeto strike against the USSR in June 1941 than American leaders have had forlaunching a number of wars – including against Mexico in 1845, against Spain in1898, and against Iraq in 2003. In none of those cases did the country attackedby US military forces present a clear and present danger to the US, or a threatto vital American national interests. BecauseHitler’s proclamation of June 22, 1941, and the German Foreign Officedeclaration of the same day, explain at some length the reasons and motives forthe fateful decision to strike against the USSR, these are documents ofhistoric importance. The texts of specially prepared translations of these twostatements are given below in full. While theprophecies of a French statesman [Georges Clemenceau] that there were twentymillion Germans too many – in other words, that this number would have to beeliminated by hunger, disease or emigration – were apparently being fulfilledto the letter, the National Socialist movement began its work of unifying theGerman people, and thereby initiating the resurgence of the Reich. This rise ofour people from distress, misery and shameful disregard was in the form of apurely internal renaissance. In no way did that affect, much less threaten,Britain. Nevertheless,a new, hate-filled policy of encirclement against Germany began immediately.Internally and externally there came into being that plot, familiar to all ofus, between Jews and democrats, Bolsheviks and reactionaries, with the sole aimof inhibiting the establishment of the new German people’s state, and ofplunging the Reich anew into impotence and misery. Apart fromus, the hatred of this international world conspiracy was directed againstthose nations that, like ourselves, were neglected by fortune and were obligedto earn their daily bread in the hardest struggle for existence. Above all,the right of Italy and Japan, just as much as that of Germany, to share in thegoods of this world was contested and in fact was formally denied. The allianceof these [three] nations was, therefore, purely an act of self-protection inthe face of the egoistic global combination of wealth and power that threatenedthem. As early as 1936 [Winston] Churchill, according to statements by theAmerican General Wood before a committee of the American House ofRepresentatives, declared that Germany was once again becoming too powerful andmust therefore be destroyed. In theSummer of 1939 the time seemed to have come for Britain to begin to realize itsintended annihilation by repetition of a comprehensive policy of encirclementof Germany. The plan of the campaign of lies staged for this purpose consistedin declaring that other people were threatened, in tricking them with Britishpromises of guarantees and assistance, and of getting them to go againstGermany, just as had happened prior to the [First] World War. I, on theother hand, have been striving for two decades, with a minimum of interventionand without destroying our production, to arrive at a new socialist order inGermany, one that not only eliminates unemployment but also permits theproductive worker to receive an ever greater share of the fruits of his labor.The achievements of this policy of national economic and social reconstruction– which strove for a true national community by overcoming rank and classdivisions – are unique in today’s world. It wastherefore only with extreme difficulty that I brought myself in August 1939 tosend my [Foreign] Minister [von Ribbentrop] to Moscow in an endeavor there tocounter the British encirclement policy against Germany. I did this only out ofa sense of responsibility toward the German people, but above all in the hopeof finally, in spite of everything, achieving lasting easing of tensions and ofbeing able to reduce sacrifices that otherwise might have been demanded of us. WhileGermany solemnly affirmed in Moscow that the designated territories andcountries – with the exception of Lithuania – lay outside any German political interests,a special [supplementary] agreement was concluded in case Britain were tosucceed in inciting Poland into actually going to war against Germany. In thiscase, as well, German claims were subject to limitations entirely out ofproportion to the achievements of the German forces. However,already during our advance in Poland, Soviet rulers suddenly, and contrary tothe treaty, also claimed Lithuania. The German Reich never had any intention ofoccupying Lithuania, and not only failed to present any such demand to theLithuanian government, but on the contrary refused the request of the thenLithuanian government to send German troops to Lithuania in that spirit forthat purpose as inconsistent with the aims of German policy. Despiteall this I complied also with this fresh Russian demand. However, this was onlythe beginning of continually renewed extortions, which have been repeated eversince. Thevictory in Poland, which was won exclusively by German troops, prompted me toaddress yet another peace offer to the Western powers [Britain and France]. Itwas rejected, due to the efforts of the international and Jewish warmongers.Already at that time the reason for this rejection lay in the fact that Britainstill had hopes of being able to mobilize a European coalition against Germany,which was to include the Balkans and Soviet Russia. It was therefore decided inLondon to send Mr. Cripps as ambassador to Moscow. He received clearinstructions under all circumstances to resume relations between Britain andSoviet Russia, and develop them in a pro-British direction. The British pressreported on the progress of this mission, except insofar as tactical reasonsdid not impose silence. While oursoldiers from May 10, 1940, onward were breaking Franco-British power in thewest, Russian military deployment on our eastern frontier was continuing to anever more menacing extent. From August 1940 onward I therefore considered it tobe in the interest of the Reich to no longer permit our eastern provinces,which moreover had been laid waste so often before, to remain unprotected inthe face of this tremendous deployment of Bolshevik divisions. Thus, andjust as intended by this British-Soviet Russian cooperation, there came aboutthe tying up of such strong [German] forces in the east that a radicalconclusion of the war in the west, particularly as regards aircraft, could nolonger be vouched for by the German leadership. This, however, was in line withthe goals not only of British but also of Soviet Russian policy, for bothBritain and Soviet Russia intended to let this war go on for as long aspossible in order to weaken all Europe and render it ever more impotent. Russia’sthreatened attack on Romania was in the last analysis equally intended to gainpossession of or, if possible, to destroy, an important base of the economiclife of not only Germany, but of all of Europe. Since 1933 the German Reichsought with boundless patience to win over states in southeastern Europe astrading partners. We therefore also had the greatest interest in their internalconsolidation and order. Russia’s advance into Romania and Greece’s alliancewith Britain threatened to quickly turn these regions as well into a generaltheater of war. Contraryto our principles and customs, and at the urgent request of the then Romaniangovernment, which was itself responsible for this development, I advised thatit acquiesce to the Soviet Russian demands for the sake of peace, and to cede[the province of] Bessarabia. The Romanian government believed, however, thatit could answer for this before its own people only if Germany and Italy incompensation would at least guarantee the integrity of what still remained ofRomania. I did so with heavy heart, above all because when the German Reichgives a guarantee, that means it also abides by it. We are neither Englishmennor Jews. I stillbelieve at this late hour to have served the cause of peace in that region,albeit by assuming a serious obligation of our own. In order, however, finallyto solve these problems and achieve clarity concerning the Russian attitudetoward Germany, as well as under pressure of continually increasingmobilization on our eastern frontier, I invited Mr. Molotov to come to Berlin. My answer:As ever, Germany has absolutely no political interests in Finland. A new war byRussia against the small Finnish nation could not, however, be regarded anylonger by the German government as tolerable, all the more so because we couldnever believe that Finland could threaten Russia. Under no circumstances did wewant another theater of war to arise in the Baltic. Molotov’sthird question: Is Germany prepared to agree that Soviet Russia give aguarantee to Bulgaria and, in this regard, send Soviet troops to Bulgaria, inconnection with which he – Molotov – was prepared to state that the Soviets didnot intend on that account, for example, to depose the King?